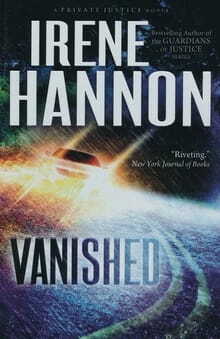 Vanished is the first book in a new series, Private Justice, by bestselling author Irene Hannon. In this series three former lawmen and an offbeat looking office manager make up the private investigative firm Phoenix Inc. Each of the partners brings their own expertise to the agency: Cal Burcke used to be a local, Missouri detective, Jim Devlin (Dev) served as an undercover ATF agent, and Conner Sullivan has a background with the Secret Service. Phoenix isn’t the stereotypical picture of a P.I firm with older, ex-cops with substance abuse issues (who no longer could serve on the police force but still needed an occasional paycheck); instead Hannon has created an agency with three younger men who all are committed to justice, yet for their own personal reasons are now doing it as private citizens. This first book centers on the background of Cal Burcke and why he left the police force after the death of his wife by a hit-and-run driver. Cal is forced to deal with his loss and guilt when Phoenix takes on a new case for an investigative journalist,Moira Harrison, who has similarly been in an accident. In this case though, she was the driver and after hitting the pedestrian in the middle of the rainstorm did stop to help the victim. The problem is that the woman she had seen in her headlights as her car was spinning out of control has vanished. Moira, whose inquisitive nature, as well as her moral background, does not allow her to leave the state of affairs alone. While the police won’t take the case since there is no apparent victim, Moira believes that some injured woman out there needs help. She presents the few facts that she knows with Cal and the Phoenix group and partners with them to try and locate the missing person and solve the mystery of her disappearance. Vanished isn’t fully a mystery novel; about halfway through the book the who-did-it question is mostly determined and the story moves into romantic-suspense genre. Some twists and turns left for the latter part of the story could have made this a more creative endeavor. While this first book is an entertaining read, it lacks the imaginative spark or interesting dialog to make it a classic. It comes across as a TV pilot where there is a great premise for a series but the characters still need a few episodes to fully find themselves and win over the audience. Even the adversary in this story could have used more development as the jump between his public persona and his dastardly, private affairs are a bit too much of a jump for believability. Fans of Hannon’s books shouldn’t give up just because this one didn’t hit five stars; the Private Justice series has a lot of potential. Hannon, who writes her books from a Christian perspective, wrestles with issues of morality not just from a personal sense with her characters, but also with the agency. What lines can or should be crossed in the search for justice for a P.I. firm? ‘Does the end justify the means?’ may become a critical theme to the series and Hannon’s storylines may challenge her readers to wrestle with their own ideas of right or wrong when it comes to pursuing justice. We won’t have too long to wait to see where she goes next; book two in the Private Justice series debuts in Fall of 2013. This reviewer is already looking forward to it.